Yes, you read correctly. That Barbara Walters. The most significant woman to ever work in broadcast journalism returns to her native home of Brookline to sign copies of her fascinating new biography, Audition. She will only sign her new book. The book must be purchased at the Booksmith and be accompanied by your receipt to enter the signing line. 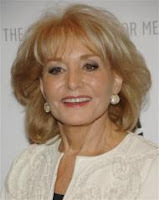 If you haven't heard, there was some scandal involving an affair that Barbara Walters had thirty years ago (here). The book signing is at 7pm tonight. Click (here) for a link to Brookline Booksmith. 1 Response to "Barbara Walters @ Brookline Booksmith Tonight"
Barbara Walter's life was influenced greatly by her older sister and she's written a beautiful memoir about her life. I read another memoir of a life influence by a sibling that I recommend highly - I actually liked it even more. The memoir is ""My Stroke of Insight"" by Dr. Jill Bolte Taylor. Dr Taylor became a Harvard brain scientist to find the cause and cure for schizophrenia because her older brother was a sufferer. Then, crazy as life can be, Dr. Taylor had a stroke at age 37. What was amazing was that her left brain was shut down by the stroke - where language and thinking occur - but her right brain was fully functioning. She experienced bliss and nirvana and the way she writes about it (or talks about it in her now famous TED talk) is incredible. What I took away from Dr. Taylor's book above all, and why I recommend it so highly, is that you don't have to have a stroke or take drugs to find the deep inner peace that she talks about. Her book explains how. ""I want what she's having"", and thanks to this wonderful book, I can!